People are stupid. What I mean by that is people will believe almost anything. That is why you play blue cards. You play the wizards and the Counterspells to out-think others. It is a game of death and you are the Sicilian. 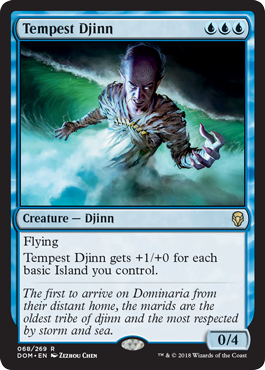 Some have considered Dominaria akin to a core set and I think that has truth to it. 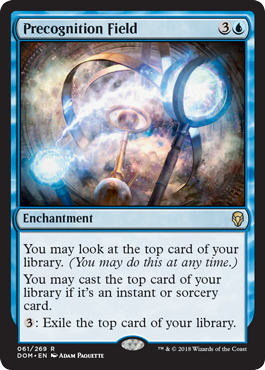 That is because the cards we see here, blue cards especially, feel like what we expect from Magic: the Gathering. 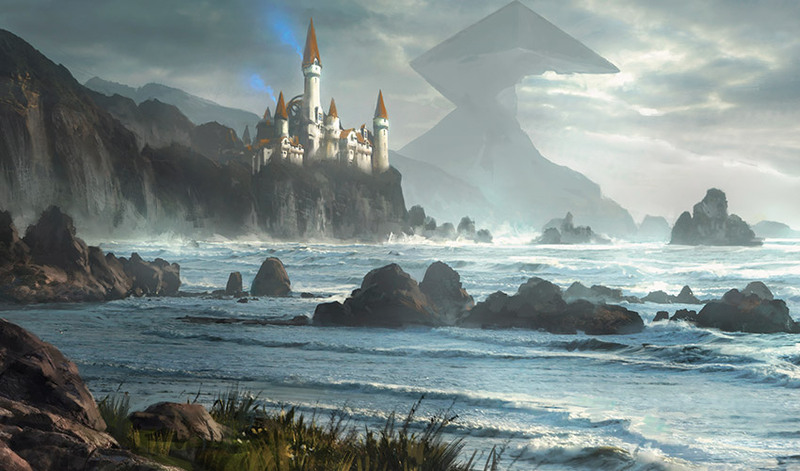 You can knock core sets all you want, but going back to Dominaria reminds us why we love this game. It reminds us what each color is good at. We remember that Island reigns supreme. Panharmonicon for wizards on a two mana creature. This is a great start to a set review. 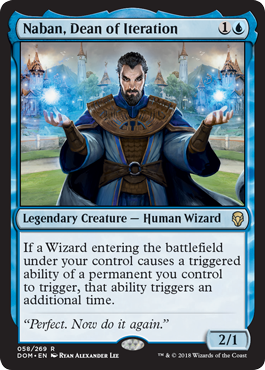 He may work best as an addition to Inalla, Archmage Ritualist, but he is at a low enough converted mana cost that you could argue for a deck to himself. Since the effect triggers for free, you can run wild with bounce and flicker shenanigans. You don’t get a bunch of free activated abilities off Naban. Your deck is going to look a lot more like a mono-colored Roon of the Hidden Realm than Inalla with utility cards, but will have plenty of overlap with both. Playing Naban on two sets up well for Sea Gate Oracle and Trophy mage. Bombs like Master of Waves and Sower of Temptation are not far off in an early game either. 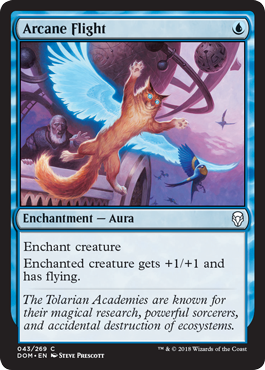 The stats on this card seem to be aimed at standard more than EDH. Four mana creatures with flash historically have done better in 60-card constructed formats than 100-card formats. This is not to discount this card’s power level. 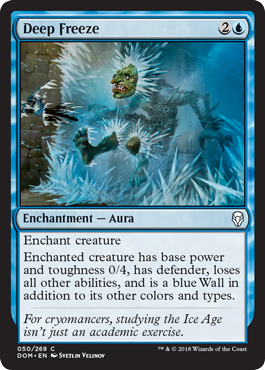 Mythic status shows how much Wizards of the Coast thinks this card can do. I don’t think this is the sort of thing you want leading your wizard army, but as a member of the 99 it plays very well being another anthem source and another piece of interaction in one. 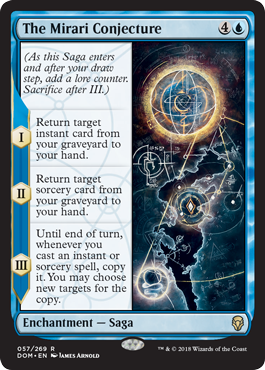 This will see play in all wizard themed decks as apart of the 99, but not much else. Slinn Voda lies in the darkest corners of the sea awaiting the moment it can gorge itself on the unsuspecting planeswalkers just above the surface. 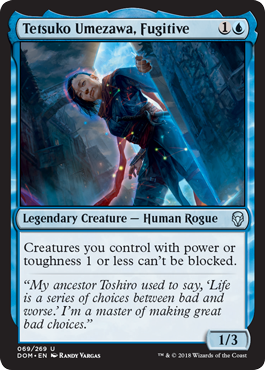 This monster is a sleeper hit among the blue legendaries we have in Dominaria. Uncommon commanders will be undervalued by some players (unless DM Cross has something to say about it) and overshadowed by other legends. 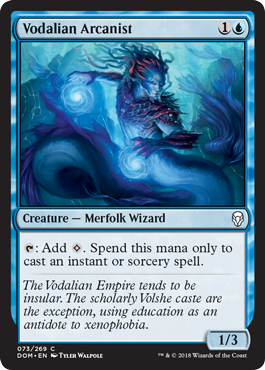 Slinn Voda, however, is the Leviathan tribal commander we have been waiting for. Equipping big blue with Lightning Greaves takes a huge chunk of commander damage out of a player. 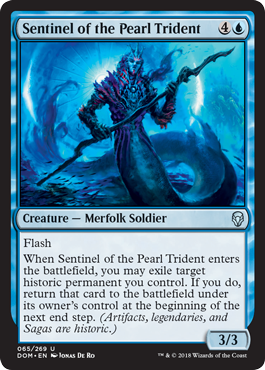 We got a taste of big blue creatures deck back in Theros with Whelming Wave and have been wanting for a commander better than Tromokratis. Which, in defense of the Theros Kraken, was not a terrible commander, but had no real synergy with the big blue pseudo-tribe other than creature type. 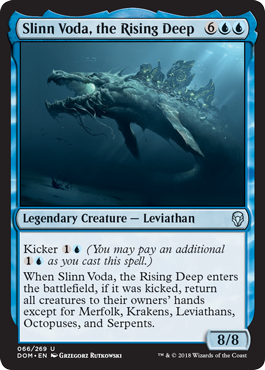 Slinn Voda, the Rising Deep is certainly expensive, and isn’t the best blue card here, but is a creature we needed. She is the commander I have been brewing with the most from Dominaria. Her ability working on one power or toughness is crucial. She is a really fun commander for my favorite tribe (that I’ve never had a commander deck for) rogues. Instant speed ways to pump, like Sacred Armory or (surprise, surprise) Umezawa’s Jitte, can turn her voltron. Deckbuilding with her is not easy, but it will be rewarding. Another card that will likely see more 60 card play than anything, but is fringe playable because of the creature type. 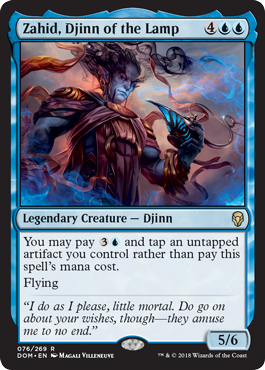 No, sadly, this doesn’t get around commander tax, but Zahid is certainly fun since you are likely always playing this for four instead of six. A deck that now makes you feel good because you can scry off Path of Ancestry when you play Tidespout Tyrant in your mono-blue deck. Redundant copies of Tezzeret the Seeker for artifact decks will see play. Digging deeper in your deck for powerful ways to abuse the third ability is just gravy. This creates tension at the table, but that isn’t always a bad thing. You can play it for a little value and will likely already be in a deck that can abuse Hex Parasite. Most adorable art must count for something, right? Cards that sit around and create utility are never bad. This birdy scrys when Sword of Feast and Famine enters and holds it well. 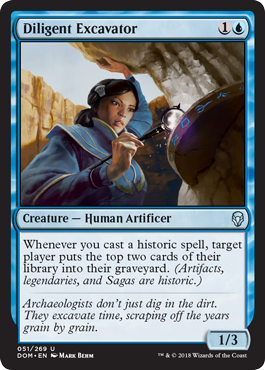 Artificer’s Assistant will get cut from many lists, but will over perform in most lists that it belongs in. Curator’s Ward will probably see more play than it should. There are many cheaper ways to give hexproof. 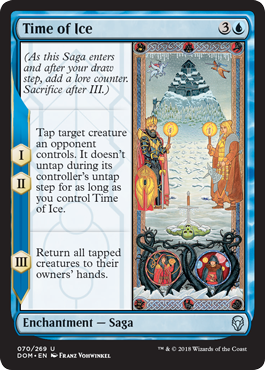 Helping build you back up from a board wipe is not trivial, but in most decks this will see play in there are likely better cards. This is a perfect fit for Bruna, Light of Alabaster, or maybe for that one weird who plays Lu Xun, Scholar General (yes, I’m talking to you Charlie.) Most should find other sources of hexproof. Imprisoned in the Moon is great in commander. This is worse than that because of mass removal, but that isn’t enough to keep it out of many lists. 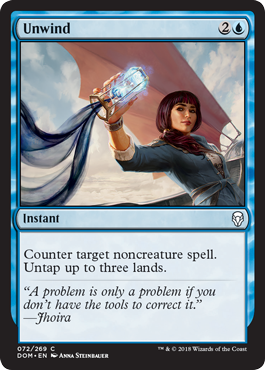 Mono-blue will want more ways to handle commanders and this is here for them. The high toughness with conditional mill stapled on could make this an auto include in Phenax, God of Deception lists. Self mill lists could like this sort of thing, like Sharuum the Hegemon. Extra turns in EDH is contentious when it doesn’t immediatly win you the game like Expropriate does. This may not fit into every list since it does cost a little more than most and is a tad conditional. 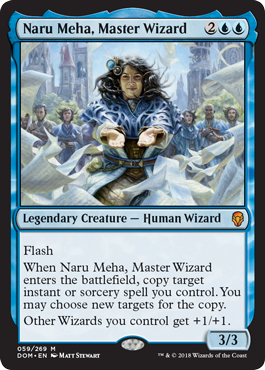 If you can flip this for free with Narset, Enlightened Master then you’re doing pretty well. 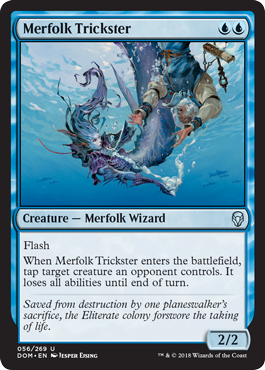 Merfolk Trickster has a lot going for it. Two relevant creature types, two relevant abilities, low cost, multiple pips of one color, and it passes the vanilla test. 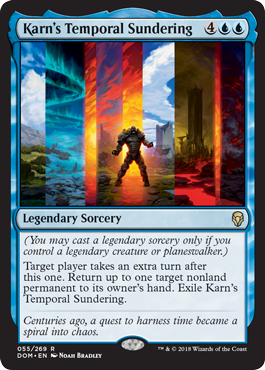 This can tap down non-hexproof commanders before combat so they don’t swing in big, and if done early enough can stifle end of turn abilities from popular commanders like Atraxa, Praetors’ Voice and Meren of Clan Nel Toth. 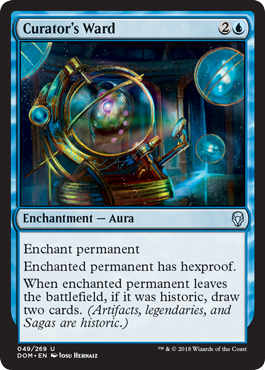 Decks that can manipulate this well, including Roon of the Hidden Realm, will find this card invaluable. This card getting back an instant as it enters is probably secretly the most relevant part of this card, because it protects itself. Playing this early doesn’t do you much, so plan to play this to rebuy countermagic on one, rebuy value on two, and hopefully your list is setup to abuse the ability on three, winning you the game. 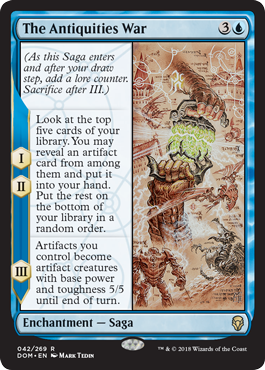 Sagas, like planeswalkers, draw a lot of heat. This card in particular needs some work to make it good, but when you can buyback and copy a Cruel Ultimatum you will be doing pretty well. Coming back from Magical-Christmas Land The Mirari Conjecture is okay. Top of the deck manipulation always finds a place in casual formats. Precognition Field having the ability to filter away unwanted cards, or combo with Misthollow Griffin and Squee, the Immortal is nice. Rashmi, Eternities Crafter and Keranos, God of Storms would enjoy more ways to peek ahead. There are probably ways to abuse this, but since this is a flicker ability and not a blink ability it doesn’t go infinite as easily. 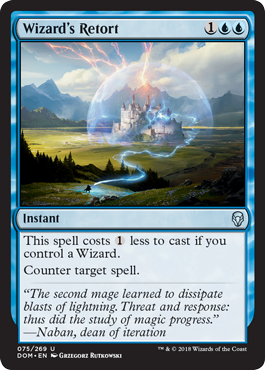 Protecting planeswalkers or important combo pieces from Shatterstorm seems fine. This doesn’t excite me, but it could see some play. Three pips and a big swing in the late game for mono blue. I guess put it in your new Zahid, Djinn of the Lamp tribal deck. Giving a little icy protection can be nice, but is probably underwhelming until you get to Stage Three. Once there it becomes an easy combo with Cryptic Command or Blustersquall. Cards that untap your lands are great. Even though it cost one more than Negate it is certainly worth it. Any deck that wants a card like Rewind will want Unwind. Curious Homunculus sees some play and this is the bad version of that with better creature types. Some may want this. Not me. Overall, blue seems to have more of the same types of tools to play around with as we have had before, but that is a good thing. I like all of the new blue legends even if some are better outside of the command zone. 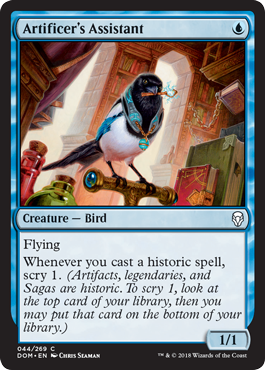 Getting more tools and creatures for wizards is important as that is the best tribe to brew with for blue in commander. I really love the set over all and I think it will live up to the hype. Let me know what you think. What did I miss? Do you agree, disagree? How adorable is that cat, and how badly do you want that playmat?